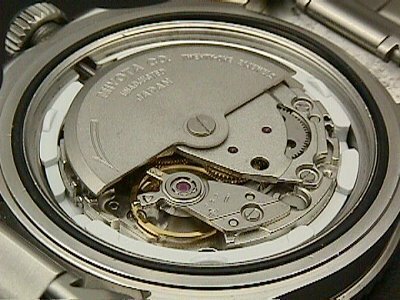 The Miyota 8215 and ETA 2824-2 are two Automatic Date movements that have been around for years. Both are fine watch movements that are dependable and accurate. Both are used by several watch makers world wide. While it is not publicized, most watch manufactures these days don’t make their own movements. Swiss manufacturers were hit hard in the mid Seventy’s with the advent of cheap disposable quartz movements. Many makers went out of business, most of those who survived now employ "ebauche" (spec) movements, manufactured by ETA, Valjoux and a few others. The Swiss ETA 2824-2 movement is used in several makes including Auguste Reymond, Cartier, Dugena, Eterna, Festina, Fortis, Gaddy's, Kienzle, Maurice Lacroix, MHR, Motochron, Oris, Schwarz-Etienne, TAG-Heuer, Tissot to name a few. The Miyota 8215 is used in such brands as Camel, Citizen, Dugena, Festina and Invicta. Miyota is owned by Citizen in Japan. The two movements, while similar, have differences that set them apart, both in functionality and application. BPH - Beats per hour. ETA 2824-2 28,800 BPH or 8 beats per second (4 Hz) vs 21,600 or 6 beats per second (3 Hz) for the Miyota 8215. Most mechanical movements run at 18,000 BPH or 5 beats per second (2.5 Hz). Both movements have higher than average BPH a plus. Accuracy is generally better on movements with higher BPH. Higher end watches employ movements with high beats per second. An easy way to judge movement quality without taking it out of the case is to watch how smoothly the second hand runs. Higher quality movements display a smoother running second hand. Finish - The finish on the ETA is smoother and more polished than the Miyota. The ETA is available with gold plating. This does not affect the performance of the movement. Jewels – The ETA has 25 Jewels and the Miyota has 21 Jewels. Jewels, typically synthetic rubis are used in watch movements, not to add to their value, but to reduce friction and wear on moving parts. Lower end watches may have only 7 to 15 jewels. The standard for quality watches is 17 jewels or more. There is an upper end to the number of jewels necessary, typically, anything over 25 jewels for these types of automatic movements are just for decoration. Power Reserve - Power reserve is the number of hours a movement will run when fully wound. Most mainsprings will power a watch for 30 hours or more. The ETA has about a 40 hour power reserve, the Miyota has a 45 hour reserve. Winding Mechanism – Both watches employ a winding rotor that winds the mainspring with the movement of the wrist. The Miyota employs a ball bearing unidirectional winding rotor. The ETA utilizes a ball bearing rotor that winds in both directions. The ETA takes less wrist movement to wind the mainspring. Shock Resistance – The ETA uses Incabloc shock resistance, a method developed in the 1930’s to allow the end jewels on the balance staff to move or ‘float’ so the balance is not damaged when the watch is dropped or bumped. The Miyota uses its own proprietary shock resistance on the balance (Parashock). Date set – Both the ETA 2824-2 and the Miyota have the quick set date function. Both movements have a track record of accuracy, dependability, and longevity.